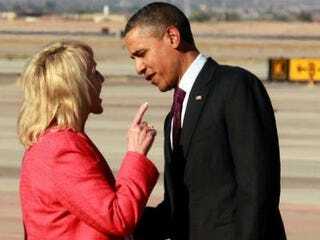 Crunk Feminist Collective blogger Brittney Cooper examines the now iconic face-off between President Barack Obama and Arizona Gov. Jan Brewer in five parts. Like most people, she maintains that it was disrespectful and that white privilege conditions white people not to see white rage. Read Brittney Cooper's entire blog entry at Crunk Feminist Collective.